We were looking for ideas for a new flat water location over the winter period and after lots of encouragement, we finally took the advice of the Hibdige family (who kindly let us stay in their stunning villa, lacbayvilla.com, overlooking beautiful Lac Bay) and booked our flights for a 5 week trip to Bonaire over winter 2014/15. 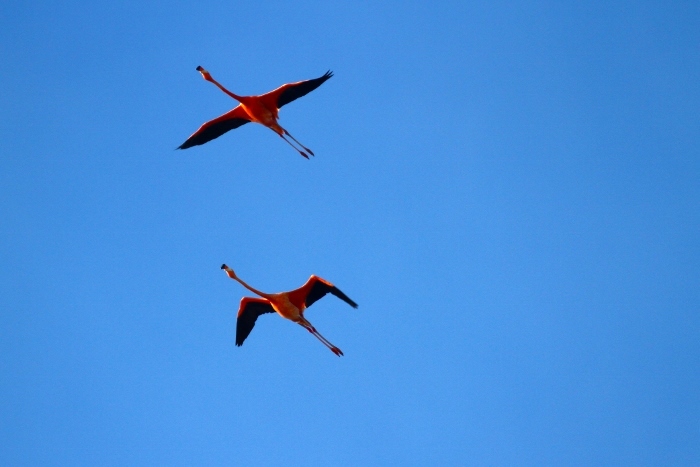 Little did we know how special it would turn out to be, and that we would spend the next couple of winters in Bonaire, extending our trip a little longer each time. We are currently planning this year’s trip as the desire to return only gets greater and greater. 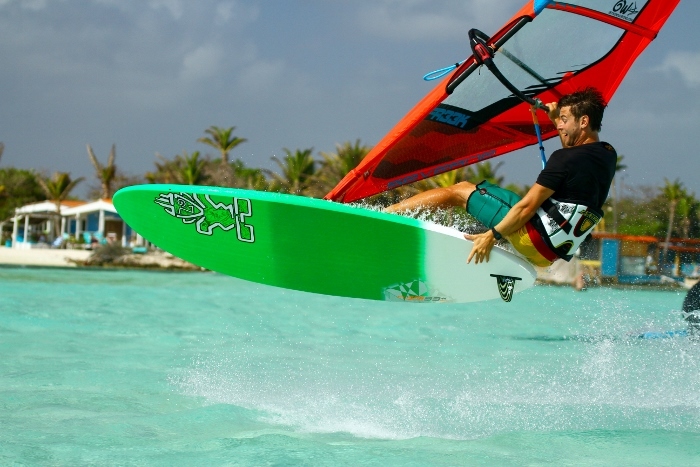 Until recent years, Bonaire, a small island in the Dutch Antilles, has attracted few UK windsurfers, perhaps due to our desire for direct flights and because we tend to choose the Caribbean Islands which have a history with the UK such as Barbados, Tobago, Trinidad and Jamaica. 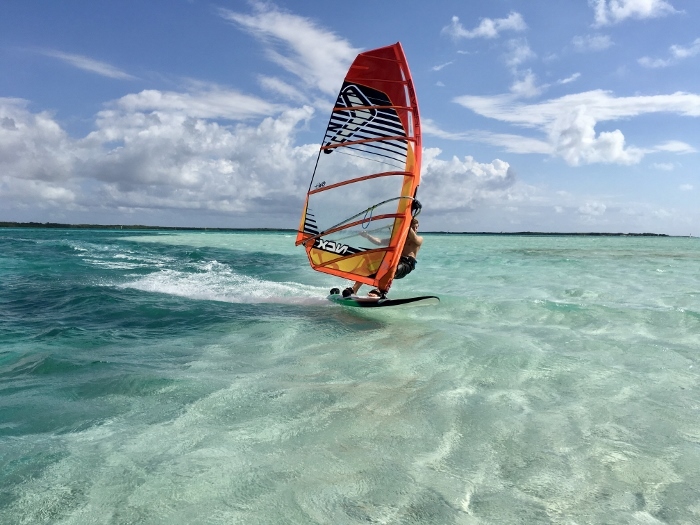 So, Bonaire has been off the radar, and the stunning blue water of Lac Bay, its consistent trade winds, which makes it an incredibly beautiful spot ideal for beginners and intermediates has been kept a secret. 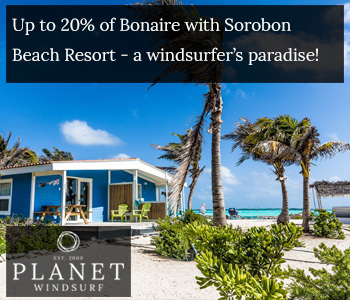 Upon arriving we were not to be disappointed, winter in Bonaire means 28 degrees air and water temperature, steady trade winds every day and the stunning crystal clear shallow lagoon for everyone to enjoy, practising and improving their windsurfing skills in an incredibly safe, forgiving environment. 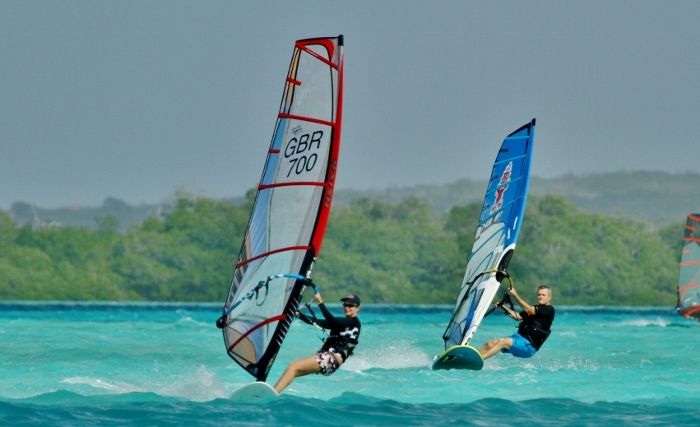 Aside from the fantastic conditions, which are just beckoning you to get out onto the water every day, whatever the wind strength, something which makes Bonaire even more of a unique spot is that it has an amazing mixture of windsurfers encouraging and helping each other to enjoy the best sport in the world. You are probably thinking, I’ve heard this all before…. 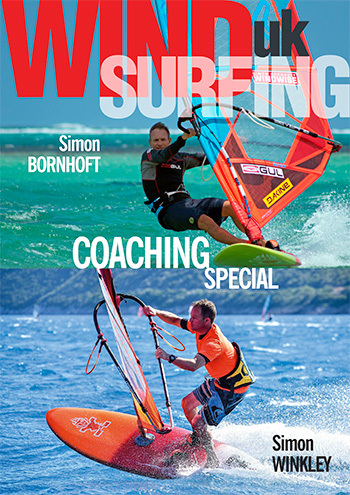 You are possibly in one of two camps; reminiscing about a past windsurfing life that you believe just isn’t possible anymore, or a dedicated windsurfer pushing to improve and learn that next move. Testing your limits is part of what makes us human right? 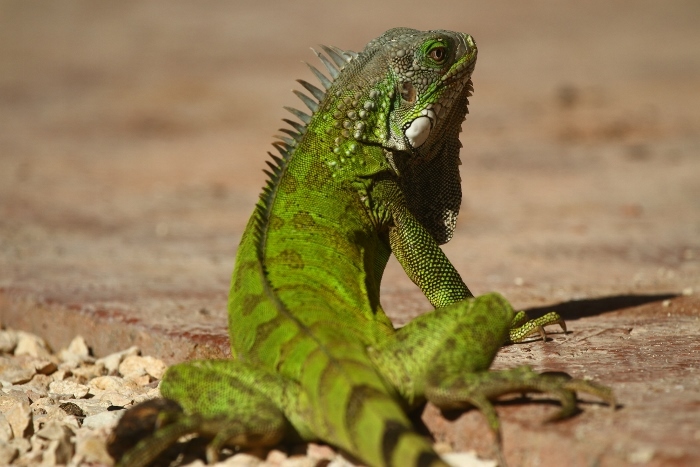 Well as we found out, the limits in Bonaire are really rather different. 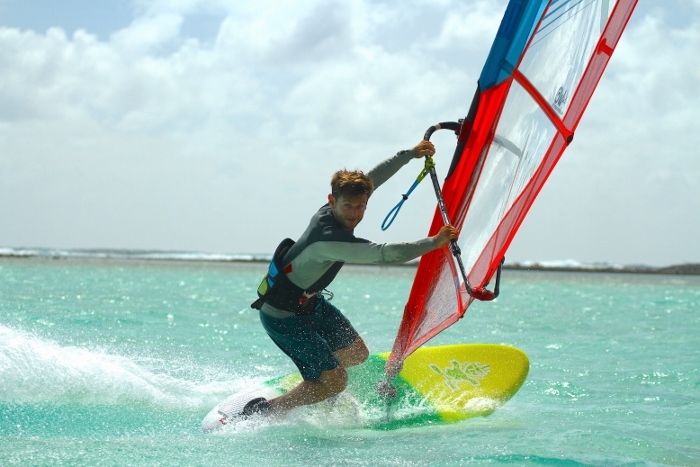 Windsurfing has so much to offer: being at one with nature, a great challenge (varying conditions mean that what you can achieve one day might not be so easy as the wind or chop builds) as well as the obvious physical and health benefits. There’s all the other stuff too, which can be really difficult to explain, which helps us all to connect and which keeps so many of us hooked. 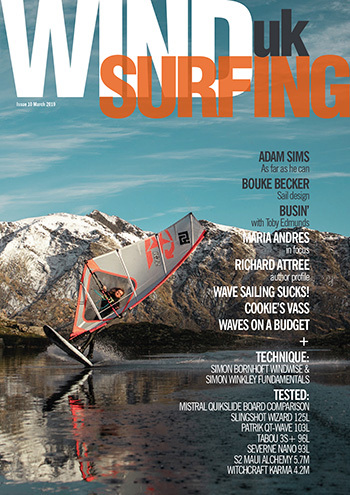 Despite all this windsurfing struggles to attract newcomers and it is even harder to encourage retirees and to convince them that getting out on the water is possible and really very good for you: fresh air, balance, dexterity, fitness, fun etc. So, there’s an American guy, in his 60’s, who last winter was cycling most days to the beach towing his trailer full of windsurfing equipment. He has something in it for most conditions, so he can maximise his time on the water, and often sails all day. That’s dedication right? Now factor in that this guy has a prosthetic leg, one which he uses for walking, running and cycling (his ‘everyday’ leg), and another he brings to the beach in his backpack, his “windsurfing leg” which he designed and made to work with the boards he’s also adapted just to allow him to get out and enjoy the wind. 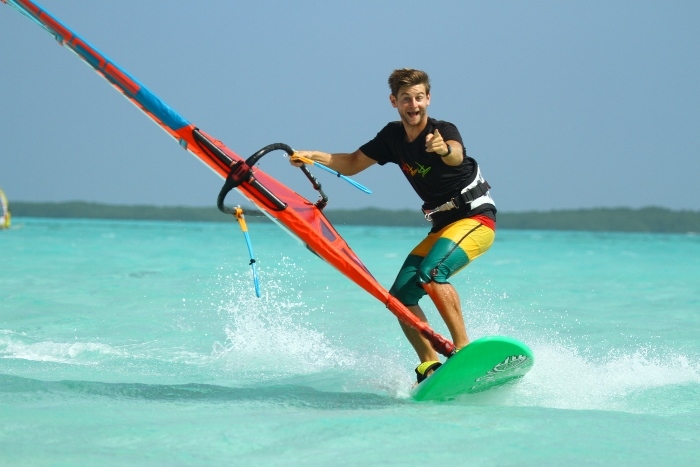 He made quite a few prototypes before he came up with one that worked, but it really impressed us that he didn’t give up and it doesn’t stop him from going windsurfing. Then there’s Marianne, from Petersfield, who I had the pleasure of coaching over a 3 month period. I helped her use her harness confidently, progress to using the footstraps and enjoy planing with control. That might not sound so difficult, until I reveal that up until four years ago Marianne was unable to do any form of exercise due to illness. Now in her 50’s and having only 50% of her lungs, she helped us take belief to the next level. After every run out and back she has to hug her board and catch her breath, before she can even listen to my feedback or next instructions, her lungs desperate for air. 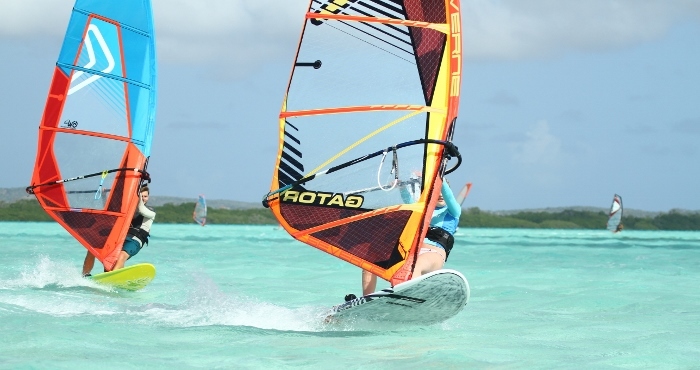 However, Marianne is keener than anyone to get on the water and progress, and Bonaire allows her to do this safely. And finally there’s Trevor, also in his 60’s, who has been sailing in Bonaire for years, but with no meniscus in his knee (and unknowingly suffering a serious heart defect) he thought that his days on the water were limited. 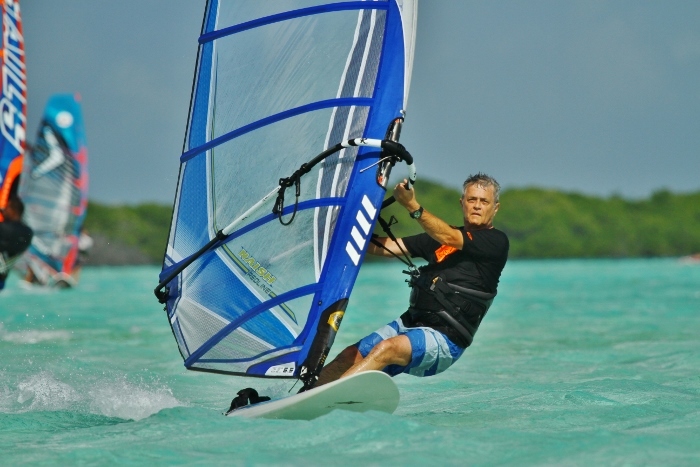 However, having had both his heart and knee fixed he knew that Bonaire was the perfect place to build up his strength and confidence to enjoy windsurfing once again and is now seen thundering across the Bay trying to beat his speed record. 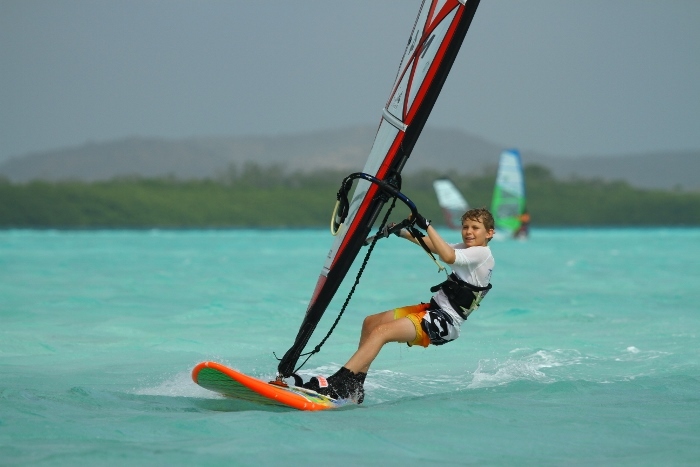 Bonaire offers the opportunity for people of all ages to enjoy windsurfing: you will see young children learning to hook in and blast around on their own, local kids learning freestyle or taking up slalom on a mixture of incredibly dated, incredibly worn out equipment , and also holding down more modern, huge fully cammed sails. Then at the other end of the spectrum older sailors in their 70’s and beyond are on the water every day loving it. 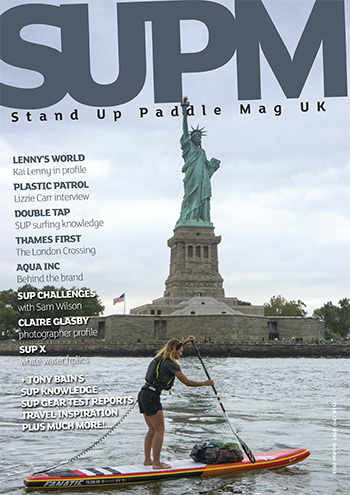 You can frequently enjoy watching an American couple, both in their 70’s, enjoying sailing together across the bay, practising duck gybes, carving 360’s and other graceful manoeuvres. 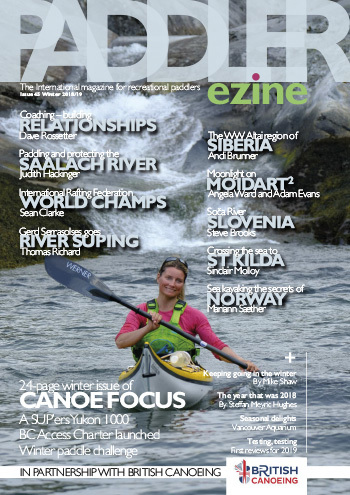 You will also see the achievements of men and women of all ages who, maybe for confidence reasons or low personal strength and/or stamina, never imagined they would be able to learn our sport. Then there are the pro’s. 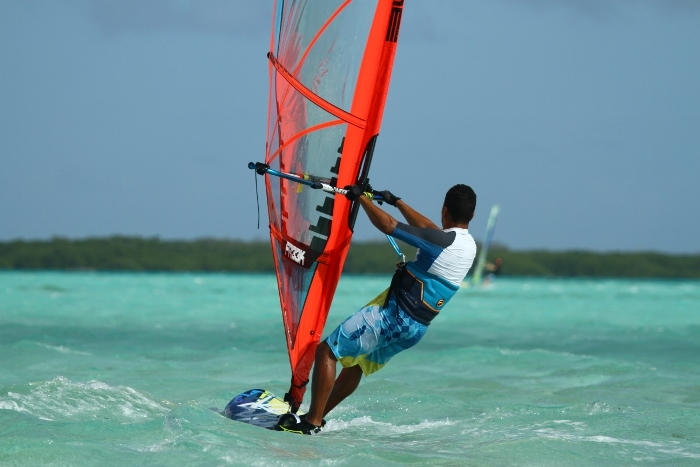 Lac Bay provides an amazing training ground for professional Windsurfers. 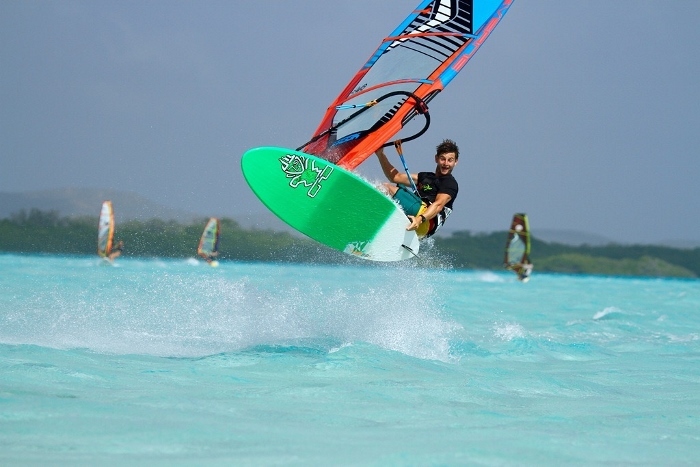 You will find yourself sailing with Slalom and Freestyle World Champions and often without knowing it people find themselves chatting to windsurf heros on the beach, sharing the enjoyment of their sessions or excitement for the next one. Bonaire’s conditions make the impossible seem all that more possible, and it’s wonderful people like these that are an inspiration to us and make our work so much fun.. However if this doesn’t make you want to give it a go then seeing really is believing and hopefully we will see you out there. 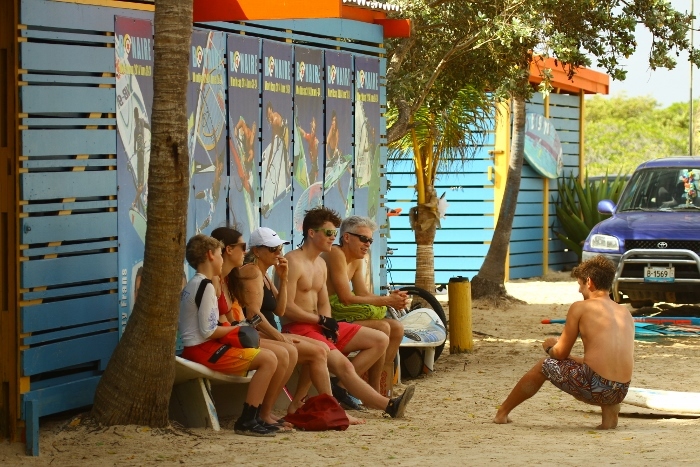 We have now made many new friends on Bonaire, every year the windsurf family gets bigger and includes people of all ages and nationalities. 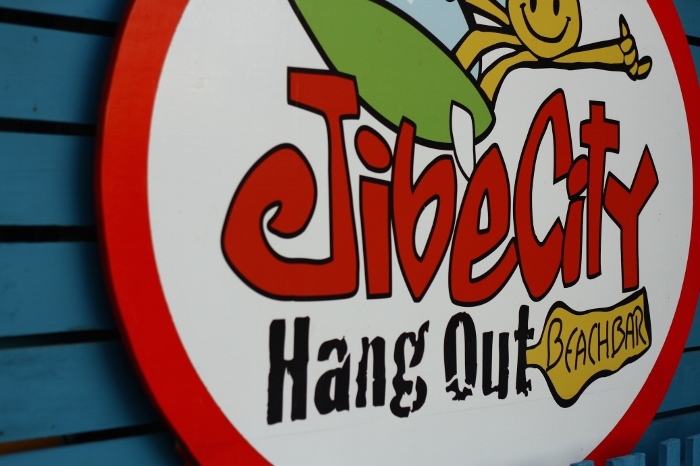 Jibe City Windsurf centre not only provides great rental equipment, but a great place to socialise, meet other windsurfers and create friendships, share tales of success and to receive or provide encouragement and support when it becomes a struggle or frustration.